I’ve had an encouraging response to my Original Art page here, and as a result I fared back into my Scary Storage Room to dig out some more of my work from the 1980’s. The room’s not empty, but I don’t think I’ll find much more of this stuff in there. For now, anyway, I’ve added 20 new ink and ink-and-wash drawings to the page. 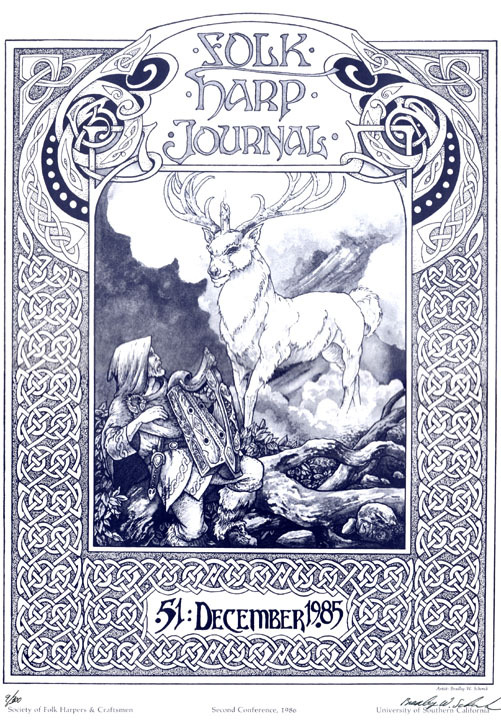 There are a few more illustrations for the Leslie Fish/Rudyard Kipling songbook, Cold Iron; more illustrations and cover art for Runestaff; and some odds and ends like three numbered prints of my cover for issue #51 of The Folk Harp Journal (shown) and my title page illustration for Pat macSwyney’s book Celtic Ceilidh for Dulcimer. If that’s not something for everybody, well, it’s the closest thing I have. Take a look! If you’ve read my last post you know already that I’m in a difficult situation; you won’t be surprised to hear that I’m trying out some creative solutions to my problems. The first of these is a page at Patreon where you can to subscribe to a monthly supply of content. There are tiers at $1, $5, $10, and $15. The highest-level patrons will get something from me every week, while the $1 patrons will see just one of the updates. The big benefits of the $15 level are (for the first year or so) print-resolution Celtic knotwork greeting card images. They’ve got transparent areas so that you can add your own images to sit inside the borders’ frames. Whenever I run out of those (or when you get tired of them) I’ll come up with something else. The rest of the content includes unpublished or obscure stories, some illustrated poems by me and by dead people like William Butler Yeats, and some first drafts (which I don’t usually share) with my own notes that explain what’s wrong with them. There are also some less-classifiable things that date all the way back to the 1970’s. I hope you’ll have a look at the page and consider supporting my work at one level or another. I’ll try to make sure it’s worth your while!